As you can see in the BEFORE image, this 400 sq. ft. flagstone floor was in desperate need of professional restoration. 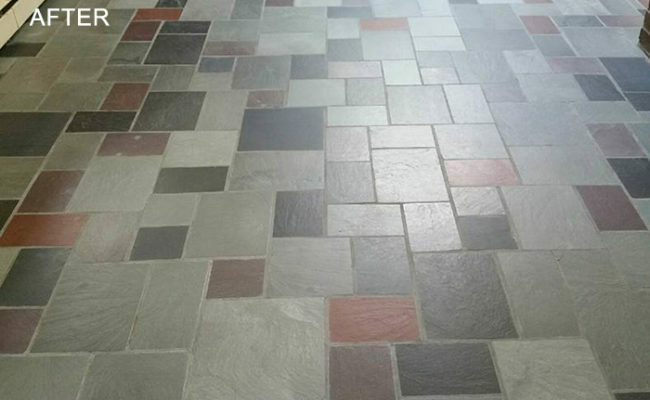 The Media/Swarthmore, PA area homeowners had been applying topical coatings to the flagstone for years, trying to improve the appearance of the floor. Little did they know the layers of coatings, which are more easily scratched and scuffed than the uncoated stone, were actually making the appearance worse, as well as trapping dirt and contaminants. We intensively stripped and cleaned the floor using a light acid cleaner to remove the heavy soiling from the grout lines and the flagstone surface followed by a stone-safe neutral cleaner to restore the pH balance of the stone and grout. We offered to apply a color-enhancing sealer to bring out the rich, natural hues in the stone, but the homeowners were very pleased and satisfied with the casual elegance and beauty of the kitchen floor just as it was once the coatings were removed. 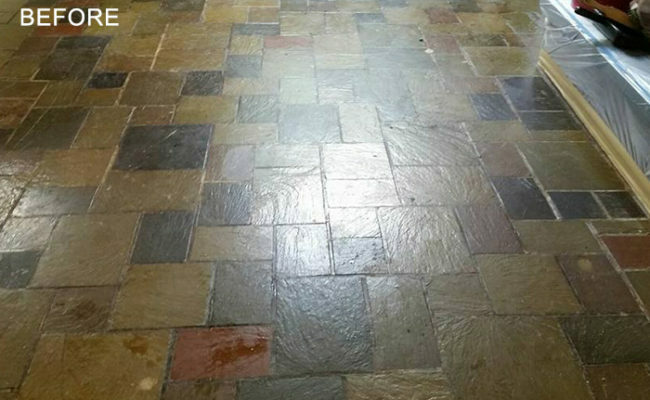 Do you need flagstone stripping, cleaning, or color enhancing services in the Philadelphia or Delaware Valley area? Use our online contact form or call (610) 356-4100 today for a FREE estimate.